I ready my seventh book this year for the 'book with a cat on the cover' category of the PopSugar Reading Challenge. 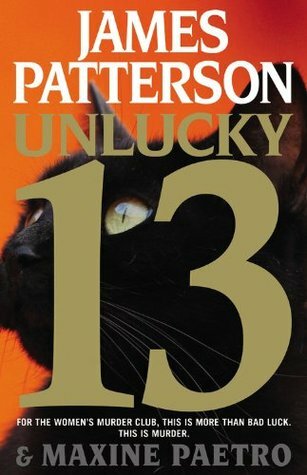 Unlucky 13 by James Patterson would be a wonderful beach read. Well, if it wasn't February in Michgan for me. LOL It was a fun read, with engaging characters and a plot that made me want to keep reading so I could find out how it all ended. As the 13th book of the 'Women's Murder Club' series, I was a little worried that I wouldn't know what was going on, but the intro of all characters and situations was thorough, so it's the only book of the series that I've read. That being said, there were some loose ends still not explained by the end of the book. Maybe they're the plot for book 14? Someone who has read more will have to let me know, as I still have a long enough to-be-read list that doesn't include it for now. If you've got time for pleasure reading on your schedule, I'd absolutely recommend this book. I believe I've read quite a few by James Patterson, and they don't disappoint. This sounds like an interesting book. I need to start a book challenge again myself. I used to be all about it until I started homeschooling haha. It's time to start again. Great post, thanks! My parents are big fans of this author. I think I've rad one or maybe even two book by him. Haven't heard of this one though. Sounds good. I'm a huge Patterson fan. Seriously, love him!